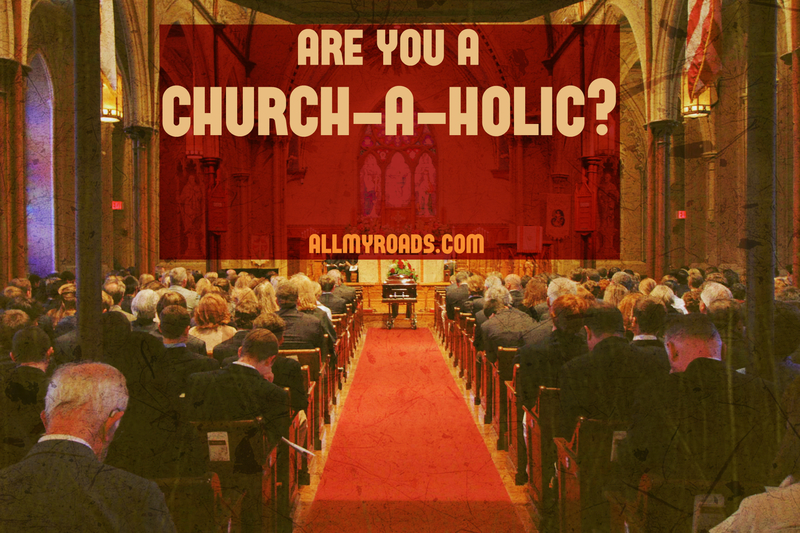 Are You a Church-a-holic ? Consider the following: on Friday as I’m walking to my apartment, I run into my neighbor. He moved in a few months ago and seems like a nice guy. We start talking and the thought occurs that I might invite him for a drink, get to know him. “Oh, sorry… I meet with a small group on Mondays.” I feel a tinge of pride as I tell him it’s a church obligation, like I slipped the magic code for “I love Jesus and you should too!” into our conversation. He doesn’t seem phased. If you can relate to this scenario, then you might be a church-a-holic. Americans are notoriously busy. Recent studies have found that -ironically- the richer people are, the less leisure time they have. Because financial success usually means that one has been pulled into the rat race where- granted, they’re doing well– but are racing nonetheless. The same can be said for Christians and the church; the “strongest” Christians are often the ones who are busiest with church programs and responsibilities. Because we love to immerse ourselves in our church community. Our teenagers go to youth group instead of parties; our children attend vacation bible school instead of summer camps. We dedicate ourselves to men’s group instead of business luncheons; we go to church, but not the local pub. We may not be of the world; but we’re certainly not in it ( contra Romans 12:1-2). We took a sip of “church-life” and we’ve become addicted. Now we’re church-a-holics. A startling number Christians don’t have any non-Christian friends and this despite decreasing church attendance and religious association across the country. Somehow Christian sub-cultures remain insulated from the winds of disbelief that have impacted the rest of culture. This could be considered a blessing. Faith is a shelter for Christians; it sustains us, upholds and emboldens us. It gives us a hope and a future. But the hope of our faith must move us outside of ourselves. For if our light does not shine because it is never in darkness then it is not light. In other words: faith turned inward becomes pride. It becomes a curse. Because the calling of the Christian is not just to love Christ but to also love others, to love the world he has created. The calling of the Christian is not just to seek forgiveness and grace for ourselves, but to intentionally pour it out upon our cities, neighborhoods, neighbors and co-workers. The calling of the Christian is not just to worship Christ, but to invite those around us into worship of him as well. The Church is called to be a witness to the world. And this is not possible when the church has no point of contact with the world. Satan’s highest aim is to quarantine Christians within the church walls. And too often he wins this battle. With our help. Because we’re so obsessed with the labor of our vineyards that we’ve never gone out to deliver the wine. We just drink it for ourselves. Christians tend to compartmentalize life. We view work as work and worship as worship. We don’t see our daily grind as sanctified unto God, so we feel the urge to tack church life onto it. And there’s only so many hours in the day. But when we spend most of them in church-related activities we’ve no energy left for the spontaneity of God’s grace to work out of and through us. We are so consumed with doing religion that we’ve none left for being Christians. Start by dividing your week into 21 “units”: morning, afternoon and evening for each day. If you have a full-time job, then at least ten of these units are already dedicated to work. Three units should be dedicated to Sabbath; turn off your phones and computers, call your parents, take a walk with your spouse, read in a hammock, play a board game with your friends: rest and know that God is God and he will be exalted throughout the world, with or without you (Psalm 46:10). In other words, apart from Sunday worship you should commit no more than two additional units of your week to church obligations. So if you’re a youth group volunteer and attend women’s Bible study, then you can’t also serve in the nursery. Provide someone else the chance to serve; remember that your over-commitment may be enabling someone else’s lack thereof. The world we’ve been called to reach is not encompassed by the sanctuary walls. Ever “yes” to the church can sometimes serve as a “no” to our public witness. Again, this is not to say that church involvement is bad- just as well-crafted beer is something in which to delight. But a twelve-pack per day is unhealthy and abusive. And over-commitment to Church serves none but our own Pharisaical hearts. So go to church, but also patronize your local pub. Attend men’s group, but not at the cost of knowing your neighbors. Chaperone church youth activities, but get to know the kids shooting hoops in your cul-de-sac. Learn what it means to rest in God and do life in his world. Refuse to be quarantined; fight the pride the fuels burnout. Are you a Christian? Or are you a church-a-holic? Thanks for this post, Bryn.